Blurb: Riding the second wave of success high, the champions of coldwave present a lean and mean album that secures their place at the top. One wave of success is already difficult to attain for any artist or band in any genre of music, but to actually have a second wave is a rare occurrence that almost never happens. Fortunately for rivetheads and fans of industrialized rock & roll, 16volt is riding this second wave rather high, having released FullBlackHabit in 2007 and AmericanPornSongs in 2009 to much acclaim from critics and audiences alike. With Beating Dead Horses, the band continues to breakdown the mechanics of the industry and offer up a powerful set of machine rock anthems that are as brutally aggressive as they are musically satisfying. 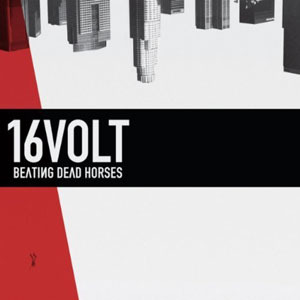 While the preceding albums were produced for the most part by a full lineup, Beating Dead Horses is a much more stripped down affair for 16volt. Produced and performed entirely by front man Eric Powell and mainstay Mike Peoples, the album is every bit as rich in its mechanized textures and rock & roll energy as past albums, but with a rawness of style and sound that recalls the band’s early days. Beginning with a distorted sample that evokes the best memories of industrial rock, specifically Chemlab’s “Neurozone” or 1,000 Homo DJs’ “Supernaut,” the title track starts off the album rather straightforwardly, wasting no time to pound the listener into submission with caustic guitars, beats, and bass lines and Powell’s venomous vocals. In typical 16volt fashion, the balance of melody with malignance plays out in songs like “The Wasteland that is Me,” “Burn,” “Breathing Water,” and “The Carrion,” with the latter song being an especially ambient moment on the album with its expansive pads underpinning the subtle layers of vocals as the beats play with just a hint of breakbeat shuffle. Other songs are much more vicious, with the thundering percussion and guttural guitar riffs of “Ghost” sounding very minimal and muscular, while “Sick Sick Sick” pummels by like a mechanical battering ram on steroids, and “Fight or Flight” thrashes by with slithering guitar chugs and squeals, a fast-paced beat, and Powell’s most scathing vocal performance on the album. In many ways, Beating Dead Horses is a rather typical album for 16volt, demonstrating that Powell and Peoples have long established a formula for the band’s music. However, this is hardly a detriment for when a band masters such dynamics to be called a signature sound, it’s something to be admired. With Beating Dead Horses presenting a leaner, meaner, more stripped down and more amped up 16volt, the band stands tall at the forefront of machine rock. Are you sure you listened to the same album I did? Nothing against the band, but personally I thought the album was very poorly done. 16 Volt is joining the ranks of many older bands who have just absolutely lost touch with the scene. I tried to play the new album at a party I had when it came out and I was literally booed and jeered until I turned it off. There are a lot of other bands out there that are pushing the limits and have far better music. You should try some new stuff that really deserves a great review. Perhaps it’s just a matter of personal taste, Jim. There is a lot of good music out there, and there’s a lot of crap. But I see also that it’s a matter of individual perceptions of “the scene.” I personally do not care for the scene. I care about the community of music lovers and musicians where it becomes less about the fashion statements, the trends, and the desire to make some kind of statement and more about the devotion to one’s own sound and development regardless of anybody else’s notions. That can give way to a lot of arrogance as well, but honestly, I don’t consider 16volt a “scene” band anymore than I consider Cyanotic, Celldweller, Cynergy 67, KMFDM, Front Line Assembly, Chemlab, Harshrealm, Rabbit Junk, Dream into Dust, In Strict Confidence, Necro Facility, or any other band making good music for its own sake and for their own sense of personal exploration. I applaud these bands for doing what they do, doing it well, and not giving a damn about “the scene.” When they push boundaries, it’s because they’re pushing to better themselves… not the scene, and that to me is what makes good music. ReGen Magazine is not a “scene” magazine. We cover a wide range of music in certain styles and genres, and while that is relevant to the scene, that doesn’t necessarily make the scene relevant to it. Now… all of that said, I can also say that having been listening to Beating Dead Horses for some months and seeing them live performing several songs on it during their stint with Thrill Kill Kult (now that’s a band that has lost touch), the crowd loved it! Old school goths and rivetheads, metalheads, and even a few people just there for drinks all loved 16volt. Their performance onstage is still second-to-none, and their music always consistent, tight, well produced, well performed. You may not like it, and that’s your choice and your taste. You’re welcome to it, and I’m sorry if you disagreed with my ReView. Thanks for the comments. Jim, a genuine question — what is some new stuff that deserves review in your opinion? I agree with Jim, this album was pretty generic sounding and really dated. Well, speaking of dated? Krystal with a K. For your info it sounds like this is more of a rock record which you probably wouldnt get. I have just heard of them and i really liked the album. At first I didn’t like it but after listening to it a couple of times it grew on me. Dissembler is perhaps one of the most original and powerful songs I ever heard. Ghost is a track that has a lot of innovation and creativity to it, heavy yet provocative. The Wasteland that is me, yet again a very powerful track! Burn is a very powerful song, I love the ambient intro then the drums kick in and it’s powerful, I think this is my new favorite band. Finally, you will all go down, great great track, ambient, powerful, provocative, this is one of the greatest bands around today.